Corsair Dominator Platinum is the world's most advanced DDR4 memory module. Like all Dominator memory modules, they are designed for extreme gaming enthusiasts and high-end system builders and take advantage of DDR4 QuadChannel technology. The package includes 4X8GB DDR4 memory modules with a total capacity of 32GB at 2666 MHz (PC4-21300) with an outstanding tested latency of 15-17-17-35. Dominator Platinum is fully compatible with the XMP 2.0 standard supported by Intel X99-based motherboards. Turn it on, and it will automatically adjust to the fastest safe overclocking speed for your Dominator Platinum kit. You’ll get amazing, reliable performance while maintaining full data integrity. Each module features an innovative passive heat sink made from high-ribbed aluminium that incorporates patented DHX cooling for reliable performance in demanding environments. Dominator Platinum modules work with the Corsair Link system for temperature monitoring, and you can even enhance the subtle white LED lighting by adding a light bar kit to match or contrast it with your system. Corsair Link Dashboard software allows you to monitor your system and gives remarkable control over your case fans, lighting, and compatible Corsair power supplies and Hydro Series liquid CPU coolers that work together for optimal cooling and performance. For shipping to other EU countries visit this page Corsair 32GB KIT DDR4 2666MHz CL15 Dominator Platinum. Für Versand nach Deutschland, besuchen Sie bitte Corsair 32 Gigabyte KIT DDR4 2666MHz CL15 Dominator Platinum. Chcete doručit zboží do Česka? Prohlédněte si Corsair 32GB KIT DDR4 2666MHz CL15 Dominator Platinum. Chcete doručiť tovar na Slovensko? 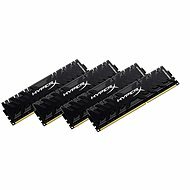 Prezrite si Corsair 32 GB KIT DDR4 2666 MHz CL15 Dominator Platinum. Für Versand nach Österreich, besuchen Sie bitte Corsair 32 Gigabyte KIT DDR4 2666MHz CL15 Dominator Platinum. Magyarországra történő kiszállításért tekintse meg ezt a termékoldalt: Corsair 32 GB KIT DDR4 2666MHz CL15 Dominator Platinum.